Editor’s note: A newer version of this post has been created. You can find it here. As content marketers, we have our work cut out for us. Getting our own, original ideas off the ground is hard enough. Unfortunately, when we add all the collecting, clipping, curating, and collaborating necessary for full-scale engagement, overwhelmed is understatement. Nothing too striking about that until you take into account that fully half that content cannot be from or about your brand if you follow the 5:3:2 rule of social media etiquette. The question is: How can you create a system to collect and curate all the amazing content out there without losing your content-curation-managing mind? To help, I’ve put together this list of 11 curation hacks designed specifically for content marketers. If you’re anything like me, you’ve spent hours getting lost in LinkedIn Pulse, Google Plus, Reddit, GrowthHackers, RSS feeds, and top-ranking blogs. It’s a love-hate sort of thing. Most of us have a tendency to spread our content collection over a host of tools: Browsers for bookmarking, Evernote for articles, Pocket for videos, SlideShare for presentations, Buffer for social media, one or more cloud providers for uploaded files, and – worst of all – emails for direct link sharing. Before diving into content discovery, it’s vital to have a simple method for compiling what you find. Focus on selecting tools that prioritize collaboration. When you want content that converts, influence and authority are paramount. ClearVoice brings to the table an algorithmic recommendation system fueled by contributions from some of content marketing’s big hitters. The free version gives you access to its Idea Lab, Influencer Search, and even workflow tools like editorial calendars, concept management, and campaign management. The paid side opens up ClearVoice’s workflow management suite as well as more creator-focused and distribution tools. If all you seek is content to curate, searching the indexed library known as the Content Studio is free. You even can share articles directly from the platform and immediately see the article’s relative popularity on major social sites. FrontPageit is the first in a handful of newsfeed curation sites. Most of these resources, including ContentGems and Curata (listed below), are algorithm driven, meaning they suggest content based on your selected preferences as well as the content you share. While FrontPageit relies in part on these type of auto-populated recommendations, what sets it apart is the personal touch. In fact, the curators are required to provide a one-sentence summary – “gist of it” – for each article they share. Moreover, FrontPageit is one of the few tools that isn’t dominated by self-promoting marketers. Its focus is on genuinely newsworthy articles in areas like health, technology, sports, family, and relationships. This makes it a great addition for a content curation strategy so it doesn’t become disconnected from the real-life interests of our target markets. 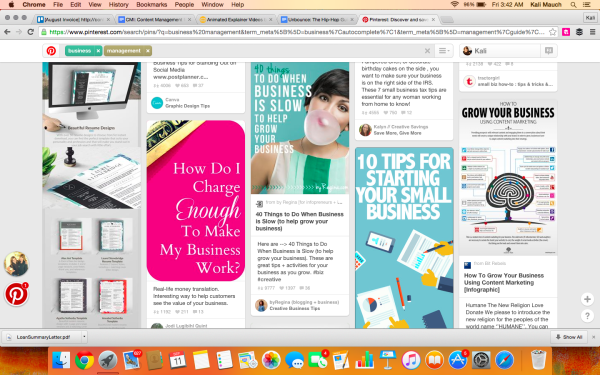 To be honest, I never would have thought to include Pinterest as a content curation tool. 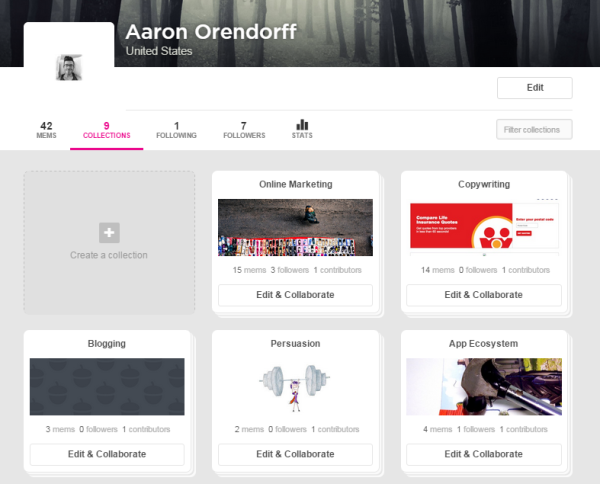 Sure it’s a great marketing and community platform, but collection and curation? Pinterest may seem like just another fluffy, feel-good website full of cupcake photos and endless boards of shoes, but beneath its soft exterior lies the makings of a powerful content curation machine. So, what makes Pinterest such a powerful “content curation machine”? First, Pinterest is a direct connection to your audience. Follow your followers, and your feed will hand you what they like. Second, Pinterest is visual. As you build a content library it can be easy to become fixated on SEO, keywords, and search queries. Pinterest reminds us that humans are creatures heavily reliant upon visual cues. Make blog images pinnable and track their success. Another great feature of Pinterest is that it can boost creativity when it comes to your own content ideas. And – since the half-life of Pinterest content is 3.5 months – your team won’t be finding stale material. A smart strategy includes pinning graphics and infographics from other people’s blog posts and linking those pins to drive leads to your site. You can easily track this tactic by tapping your website analytics. The fact is, 1.2 million people love Scoop.it! If you’re unfamiliar, Scoop.it! grew up as a lowly algorithm destined to change the way content is promoted, shared, and curated online. Since its 2011 launch, Scoop.it! has built a thriving community appealing to individuals and businesses alike. When you’re on Scoop.it!, you’re essentially surfing the web to find awesome, targeted content from and for your audience. You can then “scoop it” to publish either your own work or your favorite pieces from other sites. Instant, one-click publishing is what makes Scoop.it! especially valuable for content curation management. Not only does this create a digital paper trail to mine later, but it also connects you with influencers in your niche. Options for discovering, publishing, and curating content abound. By having content curation involved in your company’s overall marketing plan, your company can save time, money and resources. Without it, your company’s content marketers will be suffering from burnout. Content curation is the only way to go. Curata’s content curation software – a paid service – guides you through the process of finding, curating, and sharing content to your target market with consistency and data-backed ease. Curata’s specialty is personalization. Discover and sort content served up from a smart engine. It’s this intelligent content technology that allows Curata to learn your interests and direct content that’s valuable right to your fingertips. Following in Curata’s footsteps, Trap!t is another reader-learning engine. However, Trap!t’s specialty is tapping into the content curation and publishing power that most enterprise organizations overlook – their employees. By enlisting insiders for ideas and promoting other people’s as well as your own content from the inside out, you can improve your organic following, influence, and overall reach. 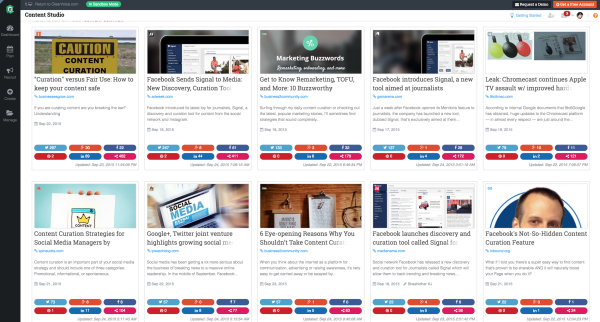 This discovery tool, which has been compared to Flipboard, learns the unique interests of each user and gathers custom-picked articles. Boost your content marketing ROI by empowering your people across departments to become advocates, evangelists, and leaders among their online circles. Recently acquired by Flipboard, Zite is a zany little service that also uses reader-learning engine technology. Zite’s focus is on evaluating millions of new stories and matching items in your feed to your interests. Zite’s news-like nature makes it unique on this list. What I mean by news-like is that Zite is the only site that tells you exactly what to read. Zite is the Pandora of content crunching. Zite gained fame for its “thumbs-up” methodology that keeps users’ newsfeeds fresh and relevant. After being acquired by Flipboard for its excellent personalization algorithms, Zite will likely fade into acquisition-dom in the coming months. But look for big things from Flipboard. Additionally, Zite is extremely friendly with image-laden content, making it a great augment to a tool like Pinterest. Here’s a Really Simple Syndication (RSS) feed that truly satisfies when it comes to content curation. We all know that reading is good for idea formation, but not every feed reader is created equal. Feedly delivers by offering a business-centered content focus. Also, it incorporates YouTube videos to add a powerful boost to the written content world. Feedly’s best benefit is its privacy feature. You can conduct your content brainstorming behind the scenes with your team. This is a huge bonus as content-creation success hinges on the ability of your team to work together. In fact, teamwork is the focus of the next tool on the list as well. If it takes a village to raise a child, what does it take to raise a company’s content? Triberr. One of the non-obvious ways to promote your content is to dive into a content community. Triberr is essentially a digital coffeehouse or corner pub. A place like Triberr delivers readers to your content while exposing you to new content. Blogger communities can support each other’s content, inspire ideas, and drive traffic all in one location. While criticized for its auto-posting tactics (theoretically, a user can tweet about an article without ever reading it), Triberr remains a premier method of exchanging ideas and accolades in a professionally focused group. A narrative timeline is a great way to curate content. Storify is the easiest search-to-save method for collecting the most up-to-date information for your target market. The biggest draw to Storify is how easily local searches can curate hyper-relevant content. On top of that, Storify brings together both journalist and user-aggregated commentary for each story. In fact, there are a host of creative ways to use Storify, including Twitter roundups, events, research, presentations, tutorials, and even product launches. 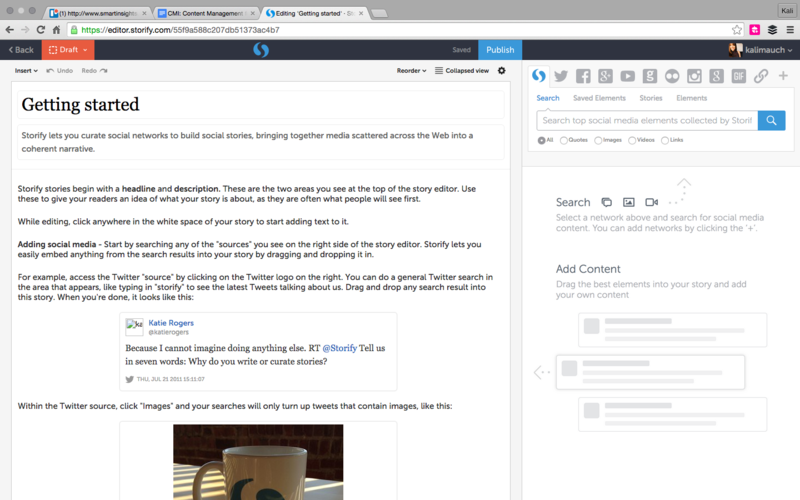 Lastly, given its journalistic overlap, Storify is an excellent resource for content marketers with one foot in the world of PR. 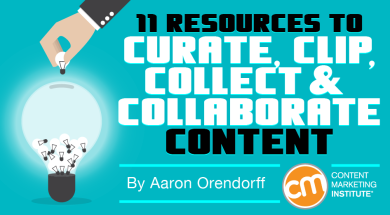 Naturally, diving into all 11 tools for curating, clipping, collecting, and collaborating can be overwhelming. So don’t. The point is to simplify your process and find out what works for your content curation management needs. Please note: All tools included in our blog posts are suggested by authors, not the CMI editorial team. No one post can provide all relevant tools in the space. Feel free to include additional tools in the comments (from your company or ones that you have used). Want to learn more on the subject, visit CMI’s content creation hub. By night, Aaron Orendorff is busy “saving the world from bad content” over at iconiContent. By day, he teaches communication and philosophy at the local college. Follow him on Twitter.